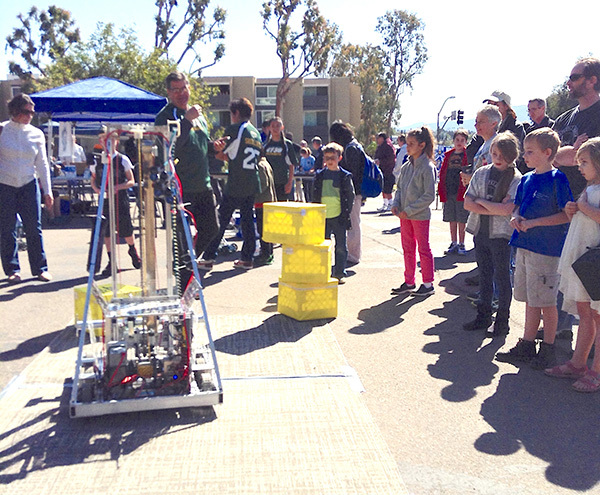 The annual Robotics Showcase Extravaganza is back on Feb. 23, 10 a.m.-1 p.m. Join us in the library’s lower parking lot for the robotics showcase, where teams from Dailard Elementary, Cajon Park Junior High, Patrick Henry High School, and the San Carlos neighborhood will display their robotic creations. Between 11 a.m. and 1 p.m., stop by the Winer Family Community Room & Art Gallery to make your own interactive robotic craft. https://conversionfanatics.com/healthandwellness cheap generic viagra mail order pharmacy Free Oasis program: Professor Blaine Davies returns to the library on Feb. 15 at 2 p.m. to give a talk titled “The Mexican War.” In this Oasis presentation, Davies explores the causes, the battles and the aftermath of the Mexican War, including the local Battle of San Pasqual, the biggest clash of the Mexican War fought in California. https://mysonginthenight.com/songwriting/ click here Author talk: On Friday, Feb. 22, 2-3 p.m., join us as local author Wanjiru Warama discusses her book, “Entangled in America.” Warama enlightens the reader to the struggles and vulnerabilities faced by an immigrant woman trying to find employment and learn how to financially support herself, while also learning how to fit in and acclimate herself to a shockingly new culture. order now Watercolor art exhibit and reception: Feb. 4-28, check out returning artist Tina Fries-Miller’s new selection of watercolors in the click here Winer Family Community Room & Art Gallery. The artist reception will be held on Feb. 16, noon-2 p.m. Refreshments will be served. order now Put a little pep in your life. Join People Enjoying Poetry (PEP) on Feb. 9, 1-3 p.m. for the first quarterly poetry open mic. Share your own work or read someone else’s poetry. We’ll collaborate to create a collection of poetry and the group will offer feedback at the poet’s request. All things Seuss: Happy Birthday, Dr. Seuss! We are celebrating Dr. Seuss’ birthday (March 2) a few days early on Feb. 27, 2:30-3:30 p.m. We will celebrate by reading his first book, “And to Think That I Saw It on Mulberry Street.” We will also learn interesting facts about the famous author, sing songs, and play Dr. Seuss bingo. Ages 4-10. Challenge Island – African Animal Safari: Challenge Island returns to the San Carlos Branch Library on Feb. 27, 4-5:15 p.m. Children ages 8-12 will use creativity, critical thinking and social skills to learn about the savannah, wetland, and jungle habitats of Kenya. They will then design and create an adventurous safari course and ride. This popular science and engineering-based program fills up quickly, so please register early by calling 619-527-3430. Feb. 20, 4-5:30 p.m.: San Carlos Friends of the Library monthly meeting. Mar. 1, 1:30-3:30 p.m.: Friends of the Library only, Used Book Pre-Sale. Join SCFOL during the sale. Mar. 6, 6:30-8 p.m.: San Carlos Area Council Meeting. Members of the community are invited to attend. —David Ege is managing librarian of the San Carlos Branch Library.